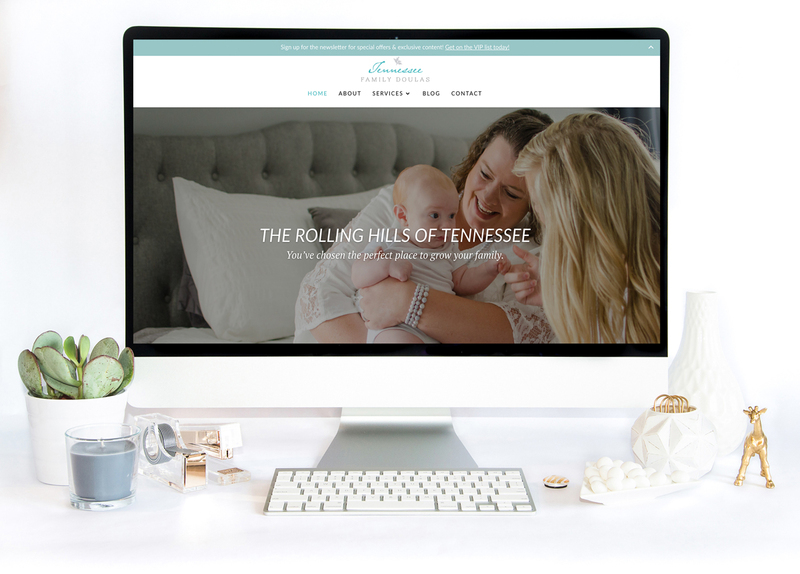 Brand & Website Launch: Tennessee Family Doulas - Verity & Co. Allow me the pleasure of introducing you to the lovely Tanya and the brand new Tennessee Family Doulas website. This wonderful lady and her growing doula agency outgrew her previous name, her previous branding, her previous website, and even her previous business model–so in the spirit of forward growth and a bright future, we rebranded BeYoutiful Birth Services to become Tennessee Family Doulas. Tanya and I quickly became kindred spirits. We both swoon over minimal yet elegant design, I immediately fell in love with her color vision, and the first logo concept was approved at first look. At a few points of the project, once the initial branding was complete, she basically told me to be creative because I just “get” her. I just about fell over at receiving this HUGE compliment. The basics of her branding included a clean, bright aesthetic to point to the professional yet approachable character of the brand, serif fonts that tend toward the traditional and elegant to point to the timeless beauty that is childbirth, and a soft and neutral color palette accented by the brilliant teal to bring out the vibrance and color of new life and family. The foliage and handwritten script bring an element of homey, down-to-earth style that Tanya brings to each of her couples and young families as she serves them in labor support and postpartum care. The new website followed suite. She opted for the custom web design to get as much of her brand personality and site customization into the website as possible. Much neutral whitespace allowed us to showcase photography from Tanya’s branded photo shoot. 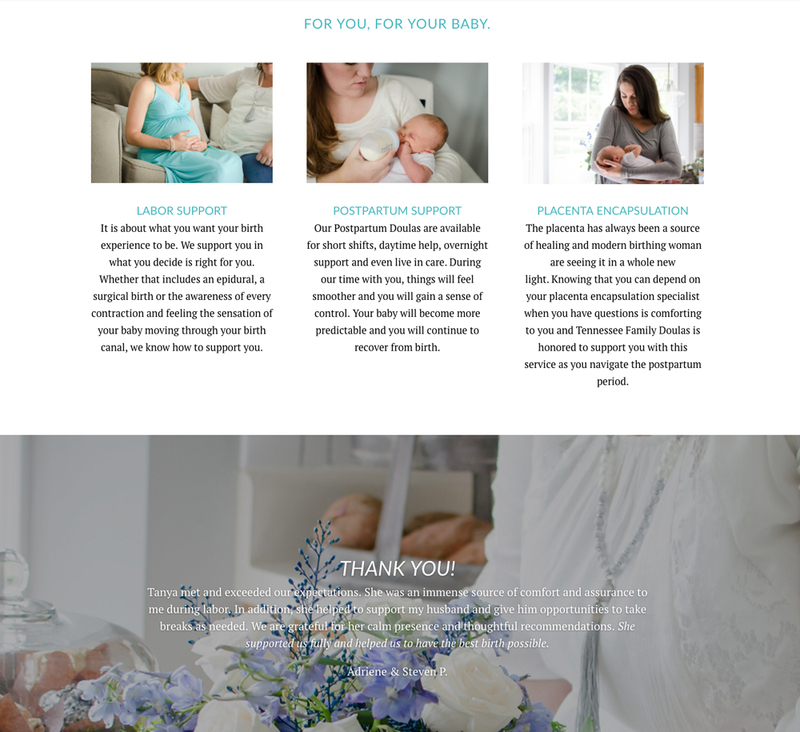 Combined with her copy, they were a joy to put together, and allowed us to create a space online to house her growing doula agency so that expectant parents come to her feeling welcome and well cared for. She plans to continue holding local events, raise awareness for how much a doula can help prepare for labor, assist in childbirth, and also help in the precious (but often challenging) postpartum days when you bring your newborn home. Please join me in congratulating Tanya, and go check out the new Tennessee Family Doulas website! Thank you, Tanya, for allowing me to be a part of growing your business, and I wish you all the best in the world as you serve your community.